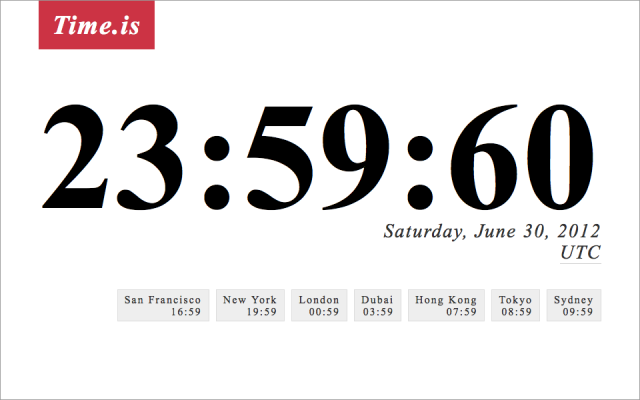 Clock enthusiasts take note: A leap second has been scheduled for June 30, 2012. A leap second is an adjustment to the atomic clock-based Coordinated Universal Time (UTC) to bring it more closely in line with Universal Time (UT), which is based on the rotation of the earth. The two time standards do not agree because the earth’s rotation is ever so gradually and unpredictably slowing down. Yes, really. So in the last minute of June 30, a leap second will be added to UTC, giving us the strange time of 23:59:60 (pictured). A total of 24 leap seconds have been added at irregular intervals since 1972 by the awesomely named International Earth Rotation and Reference Systems Service.